Black Fell Cottage is a comfortable 4 bedroom self catering holiday cottage with excellent views in a quiet lane between Hawkshead and Tarn Hows, within easy reach of Ambleside, Coniston Water and Windermere Lake. It has accommodation for 8 people. 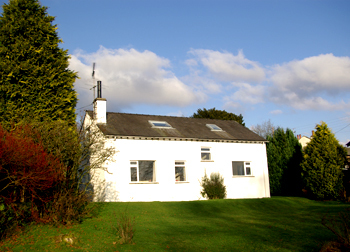 Black Fell Cottage is a comfortable modern house, designed and built in 1972, and makes ideal Lake District self catering accommodation. This Hawkshead holiday cottage has four bedrooms, sleeping eight people. There is heating in all rooms, a telephone, washing machine, microwave, open fire, a garage and parking for three cars. It has white roughcast walls and traditional slate roof, and is set in a quarter acre garden, situated in a cluster of houses in a quiet side road between Hawkshead and Tarn Hows. More details on the location page. The picture windows at the back of the cottage face south, to take advantage of an excellent view over the garden and rolling fields towards Hawkshead, with a wooded ridge from Latterbarrow on the left skyline. 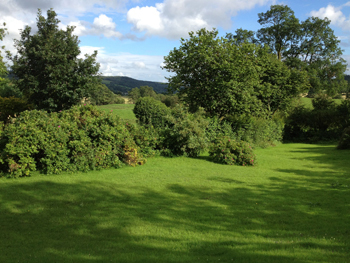 It is our own holiday cottage, we find it a relaxing place to enjoy holidays and hope that you will too. For more information and to book please visit our page at Hideaways.